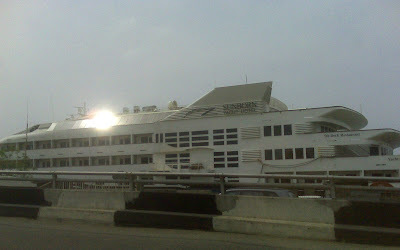 naijablog: A slice of Dubai on the Marina..
To all the doubting Thomases and cynical naysayers who thought it couldn't happen - here it is- evidence that the Sunborn Yacht hotel has finally berthed on the Marina. Alhamdulilah! Expect a rapid drop in flights from Lagos to Dubai and Doha as Nigerians enjoy the glitzy side of life at home, with Apapa/Tincan Island views thrown in for free..
Sarcasm looks good on you Jeremy. All you need now is an agent to market it for you! On a serious note though, its an awful spend but I will be so appalled, if in a year's time, the thing looks like something that even the scrapyard won't accept. With our habit of short term thinking, it would not be surprising to discover that no consideration has been made for its upkeep, which will likely outstrip cost keeping in mind the filth it is sitting on. I am adopting a 'wait and see' attitude. Afiks better have had tongue firmly in cheek when making the Dubai comparison. And by the way, Dubai is now sooooo last year. The destinations of choice for Nigerians now are Senegal, San Tome and Switzerland (for the skiing darling..). Oh ye of little faith. I am sure that all things have been taken into consideration with regards the marketing and maintenance of this boost to the tourism of lagos state. At least an addtional 150 "tourists" will be able to enjoy the wonderful sights of Lagos. And I am sure that somewhere in England there is a ship broker in a pub buying the rounds and saying "no, really, they insisted on paying double for it". May this thing sink or catch fire ASAP. Epe ti mo se yii, Baba ti mu wo ile ase. you do wear the coat of sarcasm pretty well jeremy. @kody- yeah dubai is soo last season....lol. @ toks boy- lol! "yeah they did insist on paying double they said it was just wat they needed to beat dubai off its horse. lol!" @ annonymous 2:50- which kind prayer be this one. abeg may God not let that happen. Jeez naija snap out of it! But really the planner did not think up through. How do users access the boat? No car park is a traffic invested zone does not seem a wise spot to plant a "tourist" destination.